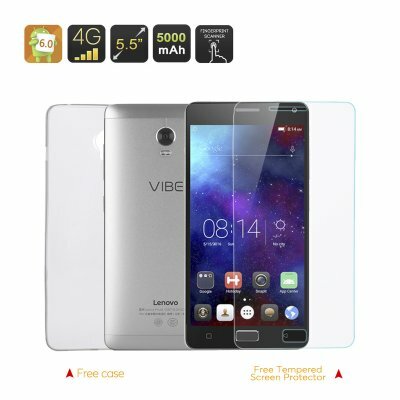 Successfully Added Lenovo VIBE P1 Smartphone - Android 6.0, Snapdragon 615 Octa Core CPU, 5.5 Inch IPS FHD Screen, 4G (Silver) to your Shopping Cart. Nothing is better than enjoying your favorite Apps, movies, and games on a large FHD screen. The Lenovo VIBE P1 Smartphone with its Android 6.0 Operating System gives you full access to the Google Play store, granting you access to over a million Apps and Games for you to enjoy on the phone’s massive 5.5 Inch IPS Full-HD display. With its 16GB of internal memory and up to 128GB of external memory you never have to be afraid to run out of storage space again, making this the perfect entertainment device. Powering this magnificent device is a Snapdragon 615 Octa-Core CPU that is backed up by an impressive 5000mAh battery. Its powerful processor and 2GB of RAM provide all the power you need for a reliable performance. Along with its Adreno GPU the Lenovo VIBE P1 can happily handle all your graphically intensive games without dropping any frames. Thanks to its whopping 5000mAh battery you can now non- stop enjoy all your games and media files for hours in a row. This much needed boost to battery life means the Lenovo Vibe P1 will keep on going when most of the competition has died. Equipped with at 13MP rear camera this Smartphone allows you to snap superb pictures where ever you go, ensuring that no memory will be forgotten. It’s 5.5 Inch FHD display that brings about 400 pixels per Inch is guaranteed to provide you with pin sharp image quality and great color reproduction. Recalling your memories by sharing home made videos and pictures on this display certainly grabs your loved ones attention.